A custom design for another skilled tradesman who knew what he wanted. 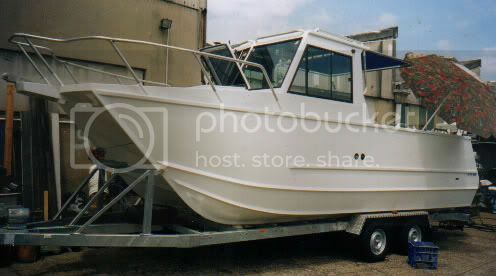 Vince Nicolosi has been pleasure fishing off shore all his life and always wanted to build his own aluminium catamaran. His dream was a 7 metre trailable craft with a smart raked bow and racy lines. There is no quick way for anyone to build their first boat. The quick shortcuts come with the third or fourth boat when past experience helps. 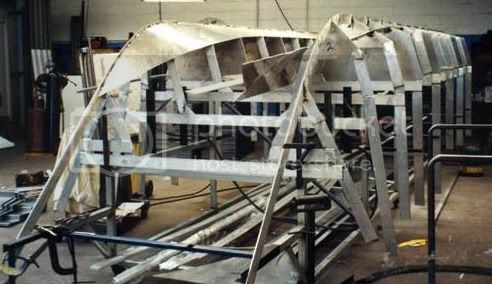 The Vince Cat is simply flat bar frames set up inverted on a building jig from which the plating is templated. Now that Vince has the hull consolidated and looking great he can concentrate on outfitting the boat the way he wants to work it. I call this " sculpturing", working the details into a very smart looking boat indeed. Painting is always a bit awkward with a cat. Vince solved the problem by standing the craft on its side. This article was published on Wednesday 05 August, 2009.